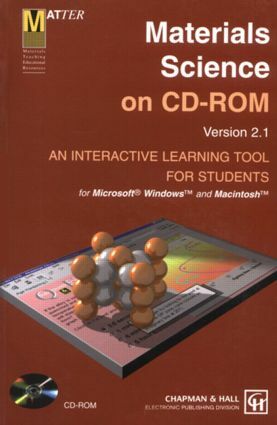 Materials Science on CD-ROM has been designed by the MATTER team for teachers and students of materials science, metallurgy, engineering, and other related disciplines. This collection of completely interactive learning modules - created to make use of those functions best performed by computer-makes it easier to understand the complex concepts of this challenging discipline. Designed to complement traditional teaching and learning methods, this CD-ROM fits well with the current selection of textbooks available and serves as a stimulating resource for teachers explaining new concepts. Materials Science on CD-ROM guides students through the key concepts at their own pace. The "hands on" approach to learning can accelerate the understanding of materials science and prove extremely useful in reviewing for exams. Its highly interactive facilities allow students to test their own understanding - for example, they can see how graphs and processes change by selecting different parameters. They can also test their knowledge by answering the questions that appear within each module. Graphical animation and hypertext links between related screens and topics further enhance these features.